New Hope Women of Today: Why New Hope Women of Today? Why New Hope Women of Today? 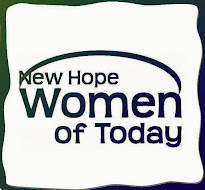 New Hope Women of Today is a non-profit organization that is focused on service, growth (personal), and fellowship. We have several opportunities to serve New Hope and the surrounding communities each month. We do several projects for the 281 school district, including a scholarship program. We also organize the Kiddie Game and Parade at Duk Duk Daze, along with the Cooper Craft Fair, New Hope WT 5K and highway clean up. On the smaller scale we dobirthday bags for NEAR, bingo at local nursing homes, and many other service projects and fundraisers. We give away over $10,000 each year to other non-profits. Each year we offer personal enrichment classes for our members and certifications in health and wellness. There are also several opportunities to learn new skills in a non-threatening environment. We encourage personal growth. Typically we hold two membership events a month. These are great opportunities for members to make new connections and friends. In the past we have done park play dates, walking clubs, craft nights, cards or game nights, socials/happy hours, wine tasting, outlet mall road trips, campfires, and so much more. The greatest part of our organization is there are no requirements on how much you need to do. It is up to you to decide what projects and events are right for you. Some years you may do things every month. Then life happens and you do nothing for six months or maybe one or two thing a year. We appreciate all members and the gifts they have to share with the chapter and community. The only two requirements are a $50 yearly membership dues that we then pay to the state for your membership in our organization and that you be 18 years old or older. Currently our youngest member is 18 and our oldest is 80 something. You do not need to live in New Hope to Join. We have members from all over the community. Everyone has something to share and all are welcome.